We all really enjoyed bubble painting. It was such fun seeing how big we could make the bubbles before they popped! 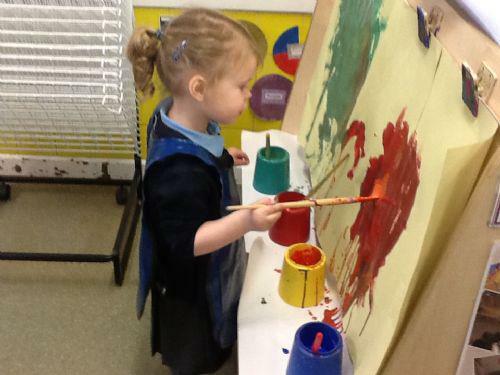 Look at how busy Niamh was in her very first week at our school. What a lovely painting, well done! Look what colour we made when we mixed yellow and red together. Magic! We had great fun splatter painting outside to create our own fireworks. It was very messy! We had a challenge to create a house for "The Three Little Pigs". We could use any of the resources in the unit. Look how hard we worked! We practised our new "Wake Up Shake Up" routine using the cheerleading pompoms. We also tried putting some of our own moves to the music. It was great fun!